There are aspects of training that are the same whether you are training someone to greet new visitors or training someone how to preach. The basic pattern of Model, Assist, Watch, Leave (M.A.W.L.) is universal in its application. 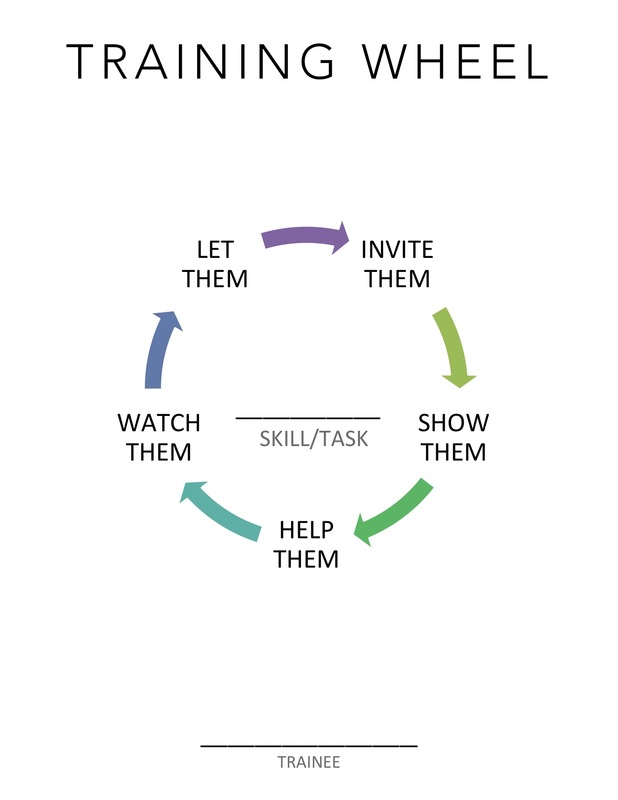 Training Wheels use this model to help in both our leadership development and disciple making. They are cards we hand to people in our ministry with the charge to train someone in something. That “someone” and “something” can be determined by the ministry leader, spotting a critical need, or it can be left to the trainer to decide. The result you want is to have a ministry full of capable trainers, something every growing ministry needs. Let’s examine each step. This is probably the most difficult step for the trainer. Set up a time for the trainee to perform the whole task on their own with no help from the trainer. The trainer is only there to watch the trainee and offer feedback after the activity. What did you think you did well? Where do you think you need some work? What will help you get better or more comfortable? This is graduation day for the trainee. They will do the activity without the supervision of the trainer. Helpful tips and fielding questions may continue but the trainee should be proficient enough to do the activity on their own. They also are now eligible to be a trainer themselves. After marking the date, the training wheel card can be turned back into the ministry leader. Just for fun, you can offer a reward for each card turned in. The advantage of using this approach is how it can be applied in so many areas. Once someone becomes an expert trainer in door greeting, it’s not so hard to convince them they can train anyone in something else they know how to do. The easy crossover from ministry skills training to discipleship training makes it a worthwhile tool to have in your ministry. Download the Training Wheels pdf here with samples and multiples per sheet.